Design Therapy: The New Classics. 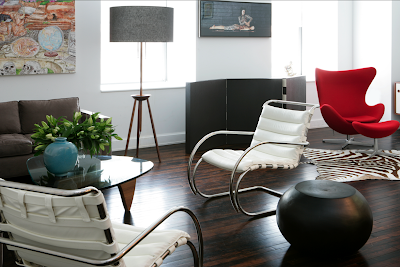 Here's a space I designed for a client that runs a gallery in Chelsea, Goff+Rosenthal. The art on the walls constantly changes so we wanted to create an environment where the furniture could hold it's own, but at the same time, not compete with the art. I chose a few iconic pieces, such as Jacobson's Egg Chair, the Mies Lounge Chair, and Noguchi's Coffee Table, and combined those with what I think will become the New Classics: Dune's Climate Sofa, BDDW's Tripod Lamp, and Tucker Robbin's African Pouf, crafting what I consider a modest but confident room. So neat and clean. Great design!